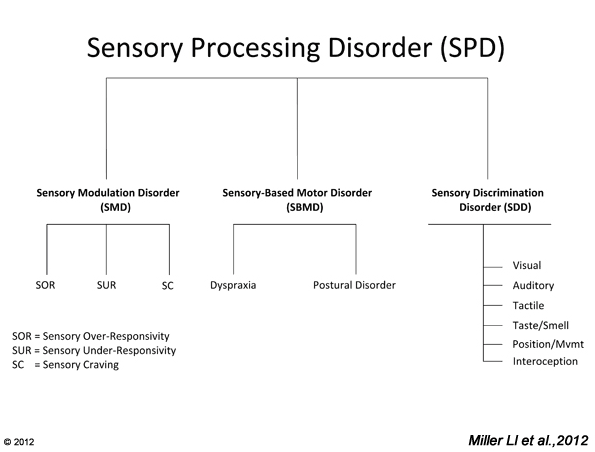 As I shared in a previous post, Dr. Lucy Miller has identified six sub-types of SPD under the umbrella term of sensory processing disorder. In the next few posts, I want to discuss in detail the definition of each sub-type, the red flags you might notice, and the associated behaviors you might be dealing with. It’s important to keep in mind that a child (or adult) may have any combination of the sub-types, and each of the sub-types can affect any one or more of the 8 sensory systems. It’s largely true that no two experiences with SPD are the same! The information contained in this post comes from the STAR Institute and Dr. Miller’s book Sensational Kids, and is readily available in more detail through those resources, if you’re interested in digging deeper. Modulation disorders are characterized by chronic and severe problems with turning sensory information into behaviors that match the nature and intensity of the message. Individuals with modulation disorders often have difficulty regulating responses to sensory stimuli. Children with SOR can appear to always be on “high alert” or display heightened anxiety in some situations or settings. It’s likely that this is caused by repeated exposure to sensory input that is uncomfortable or unsettling. For some, their behavioral response is to withdraw and seek out quiet spaces, or to avoid participation in daily activities such as socializing or community outings. For others, the response might be to become loud and aggressive as a way to express their discomfort or over-whelmed feelings. Some children who experience SOR become very controlling and demanding so as to protect themselves from what they perceive as painful experiences (ie: being exposed to loud sounds or painful touch). Children with SOR are most often helped by accommodations to reduce the intensity of the sensory experiences, such as by reducing sounds (through use of headphones or environmental modifications), and by empathic responses from those around them, helping to validate their experiences and alleviate anxiety. The Ultimate Guide to Sensory Processing Disorder: Easy, Everyday Solutions to Sensory Challenges By Roya Ostovar, Ph.D.
And don’t forget: if you’re local, join us at our Introduction to SPD with Q&A events on October 26 and 30. Learn more here, and contact us for more information about SPD or to discuss your child’s needs. Last post, I shared some information about what SPD is. This time I want to talk about what it is NOT. I am a big advocate for understanding sensory processing and helping families navigate the difficulties that come with the various sub-types, affecting a child’s development and participation in daily life. As part of that advocacy, I often find myself responding to mistaken ideas that people have about SPD. Sensory Processing Disorder (SPD) is NOT a medical diagnosis. The STAR Institute worked for more than a decade to have SPD added to the Diagnostic and Statistical Manual – 5th Edition (DSM-5). These listings include clear diagnostic criteria and guide a physician in making medical diagnoses for mental and neurological disorders. When the DSM-5 was published in 2015, the editing board ultimately determined that there was not enough evidence to support the addition of SPD as a separate diagnostic category. They did, however, add sensory processing issues (sensory hyper- or hypo-sensitivity) as an additional criteria of Autism Spectrum Disorders. The STAR Institute continues to support research in this area to help identify SPD as a unique diagnosis. SPD is not what everyone with “quirks” has. We all have sensory differences, and some of us have specific preferences or needs when it comes to sensory input. If you don’t like scratchy sweaters or need to have silence to get work done, you don’t have SPD. Individuals with SPD experience the world very differently and struggle to participate fully in it due to their difficulty interpreting and responding to sensory input. The hallmark of SPD, as described by Dr. Lucy Miller (STAR Institute founder), is that the condition is chronic and disruptive to daily life. SPD is not something that can be “fixed” or “cured” by treatment. BUT, the symptoms can often be reduced in intensity, with a resulting decrease in the impact of SPD on a person’s daily life. A comprehensive therapy approach includes direct treatment to help with learning skills and potentially altering how sensory information is received and processed. It would also include education regarding how to manage daily tasks and accommodate the individual’s unique sensory needs. Skilled therapists help individuals to advocate for themselves and better understand how to cope with SPD, while educating families (and others) to facilitate an understanding of the condition that changes relationships and supports participation in daily life. Sensory-sensory based treatment is not the answer to every problem. Issues with learning, behavior, social interactions, or daily task participation may not all be solved with therapy. There is a growing trend toward using sensory based strategies to support all children who exhibit difficulty with self-regulation, attention, learning, behaviors, and social interaction, but using a “sensory lens” to address these issues may be only one piece of a complex puzzle that needs to be solved in order to best support a child’s development and success in daily life. Understanding SPD can be helpful in solving problems for children who exhibit symptoms of the disorder, but it is most powerful when you combine it with a full understanding of the child and the specific challenges they experience. Our blog series for SPD Awareness Month continues soon, with more information on the sub-types and resources to help children with them. Understanding sensory processing disorder can be difficult in large part due to the fact that there is not currently a medical diagnostic description for it. Other disorders like autism, ADD, or specific learning disorders have this kind of outline, and are known well to health professionals and parents alike. While Jean Ayres, PhD, OTR defined sensory integration and sensory integration dysfunction in the 1970’s, there has been on-going research and diverging theories that actually make it even harder for us to talk about SPD as a condition. One could argue semantics over a philosophical debate, but when discussing a medical condition, it’s most helpful to have a common language. It ensures we’re all on the same page. To that end, Dr. Lucy Miller has proposed using the term “Sensory Processing Disorder” as an umbrella term that includes six sub-types of the disorder. The below graphic is a little dense, but it gives you an idea of the umbrella and everything that’s underneath it. SPD is not one condition but rather a collection of conditions that are each unique in terms of symptoms. Dyspraxia and Postural Disorder – motor-based disorders – are most closely associated with problems in processing vestibular (movement) and proprioceptive (body awareness) input. Modulation disorders (when it’s hard for someone to regulate their level of alertness) can affect any of the 8 sensory systems and often appear in combination. For example, a person might be SOR (sensory over-responsive) in auditory, SUR (sensory under-responsive) in tactile, and sensory craving in vestibular/movement. Sensory discrimination disorders are the inability to perceive subtle differences in sensory information. That leads to poor interpretation or perception of information, and these disorders can affect any of the 8 systems. An individual can have any of the 8 systems affected by sensory processing issues. This creates a huge list of potential combinations of SPD sub-types – millions of possible combinations when you do the math! In order to determine what approach, strategies, and accommodations will help with reducing the impact of the disorder, in-depth examination and understanding of an individual is essential. Hopefully, that’s a good start on the basics of SPD, and what’s meant by sub-types and various disorders with in the condition. Next up: We’ll look at each sub-type individually and explore the various associated behaviors you might encounter in children struggling with them. It’s that time of year when parents are wondering how their child is doing at school and teachers are working hard getting to know the children in their class. Getting communication between home and school off to a good start is an important step to ensure that parents and teachers are working together on behalf of the child. Here are some tips for parents on how you can support positive communication with your child’s teacher. Ask the teacher what method of communication is preferred and then use it. Some teachers prefer emails while others are using texting apps or web-based programs that organize classroom information and messages. Be sure to clarify what method your child’s teacher prefers and then learn how to use that method effectively. Ask for instructions from the teacher or school office if necessary. If your child has potential emergency situations (for example, allergic reactions) make sure that school staff, you, and other involved adults are clear on what method will be used in case of such an emergency. Setting systems up from the beginning reduces stress later. Frame communication in a positive manner. Use positive language that focuses on the child’s needs instead of language that demands responses from the teacher. No one appreciates being scolded or told how to perform their job. Making requests for accommodations, follow through, or problem solving can be first presented by stating what you notice your child is struggling with and offering ideas of how this has been addressed successfully in the past. Remember that parents and teachers are part of the same team for the child. The goal is to have a cooperative relationship, not an adversarial one. Teachers don’t know how involved you want to be unless you tell them. If you want the teacher to initiate communication about specific aspects of your child’s behavior, be sure to provide that information specifically. For example, if you are working on organizational skills at home and want to know each time your child fails to turn in an assignment, clearly (and politely!) make that request of the teacher. In some instances, a teacher doesn’t communicate an issue with parents because they simply aren’t aware that the parent wants to know. Some parents are more involved than others. Triage your communication. Every piece of information is not as critical as the next. Take some time to think about how critical your communication is before you hit “send” on the next email or text. Re-read your message and be sure that you have communicated in an objective and positive manner, not reacting emotionally or hastily in the heat of a moment. Be respectful of the teacher’s time and be professional in your communication – modeling what you would like to receive from the teacher. Communication around a child’s needs can get heated and emotional, and understandably so. It’s important that we all stay objective and focused on what matters most – solving problems and supporting our children’s success. Starting off on the right foot will ensure you, your child and your teacher all have the best shot at a successful school year. When Is Clinic Based Treatment Appropriate? I’ve talked about the difference between school based and clinic based therapies before. While many children qualify for and receive school based therapy, some children benefit from therapy that is beyond the scope of what is provided in the school setting. As a parent, it can be confusing as to whether a child should get school therapy, clinic therapy, or both. While school therapy is a vital part of a comprehensive program for supporting participation in the academic setting, school based therapy does not (and should not) address all the needs for every child. The addition of speech, occupational, and physical therapy into a child’s IEP (Individualized Education Plan) is dependent on whether there is a specific need related to impairments that are impacting the child’s ability to participate and benefit from the educational setting. These services will be provided within the context of school and from a practice model using an educational frame of reference. Clinic based services are appropriate when the child’s needs go beyond the limits of school performance and impact the child’s participation in home and community settings. Clinic based therapists are able to address the whole child within the context of family, home, and community without the limitations of law imposed on school based therapists. While a clinic evaluation can be helpful in advocating for school related services, clinic therapists cannot make recommendations specific to a school setting without being actively involved in that setting (ie: observations in the classroom, participation in planning meetings). Nevertheless, clinic based services can provide insight to a child’s needs through a different lens, providing assistance to all those who are invested a child’s success. If you’d like to learn more about the services STEPS can offer in our clinic-based environment, get it touch today. Getting back into the school routine means back into the routine of getting homework done. For some of us, it means back into struggles, fights, and meltdowns. Here are some ways to help reduce the stress and make getting homework done more successfully. Think outside the box. Homework doesn’t have to be done at the dining room table. Consider your child’s needs and preferences to choose a place or a variety of places to do homework. Offer a variety of seating options (chair, couch, floor, beanbag chair, swing, or ball-chair) that meet your child’s needs. Even better, put some play in the homework routine! Practice math facts while jumping on the trampoline, run an obstacle course writing spelling words at different stops, or do a treasure hunt to find definitions for vocabulary practice. Focus on what your child really needs to learn. If your child is struggling with task focus, make sure that you are accommodating and teaching how to extend focus. If you are trying to build independence and self-direction in learning, use checklists for your child to refer to. If your child is easily frustrated with mistakes, take the time to teach resilience and persistence. Sometimes completing the homework isn’t as important as the skills gained from the effort of trying. If your child balks at doing homework and you find yourself engaged in power struggles most evenings, ask yourself “What does my child need to succeed?” Providing your child with the right support makes all the difference. What’s more, understanding your child’s needs and responding in kind will help you structure homework so it is the “just right challenge” that motivates your child while challenging just enough to be successful without the frustration. One of the biggest concerns I hear from parents and teachers alike is non-compliance in the classroom. Children can get angry and frustrated, avoiding specific tasks or all tasks as a result. Teachers are understandably confused and overwhelmed, unsure of how to motivate a child to learn or gain their participation in the classroom. Over the years, I’ve helped problem-solve more of these types of situations than I can count, and I’ve found that much can be improved with some approachable and thoughtful changes. When teacher make an effort to modify their interactions to be more empathic while adopting the perspective of “children do well if they can” (Ross Greene, PhD), the situation typically begins to resolve itself. Establish your classroom as a safe and welcoming space. Greet students when they enter, thank them for coming to school and for learning with you, wish them well when they leave for the day. Make every student feel like they are wanted and belong in your classroom. Create a community in your classroom. Have the students be part of identifying the rules and expectations for behaviors. Post “class values” where all can see and remind students regularly of those values. Point out when students behave in ways that demonstrate those positive values. Encourage students to support fellow students, support the classroom as a whole, and support you as a teacher. Remember that children do well if they can, not if they want to. Dr. Ross Greene, author of The Explosive Child, emphasizes that children who are not successful fail because of a “lagging skill,” and it is up to us to determine what skill needs to be taught in order to right the ship. Simply changing your mindset to start asking “what skill does this child need to succeed?” will help you interact in a more empathic way. Focus on teaching a skill when you respond to a child. The child in your classroom who is always interrupting needs to learn the skill of waiting. Responding to an interruption with a punishment or “you need to wait your turn” in a frustrated tone does nothing to teach the skill. Responding with “I see you have something important to say but it is Sarah’s turn right now. When Sarah is done, you can raise your hand for your turn” is more likely to help the child understand waiting and turn taking. Seek to soothe a child and help with self-regulation BEFORE you address the non-compliance with a task. Failure to shift direction and address an emotional outburst will only lead to a power struggle and increased emotional reactivity. For more emotionally intense children, have a plan in place to respond to outbursts. Better still, learn how to read the child’s signals that an escalation is likely and respond proactively by adjusting the task or offering calming activities. As an OT, my role is to support students and teachers so that they can fulfill their occupational roles, having success in their activities in the school environment. Helping teachers to understand the individual needs of each student is a vital part of that role. Lives in The Balance – Ross Greene, PhD’s website full of resources and readings. Bloom Your Room – a site from Lynne Kenney, PsyD specifically focused on classroom success. How To Talk So Kids Can Learn at Home and in School by Faber and Mazlish – a must-read for every teacher and parent struggling with children who want to succeed if they can. And of course, STEPS for Kids offers workshops and consultation services to support students. Contact us today for more information. According to the Child Mind Institute, anxiety is the most common emotional problem in children. It can manifest as common fears of the dark, separation issues, problems with social interaction, or persistent worries that interrupt daily activities and sleep. While some anxious kids are cautious and shy, others have tantrums and emotional meltdowns. Some children withdraw while others develop elaborate rituals to help them feel in control of the world of around them. Anxiety can be an underlying factor in symptoms of sensory processing disorder, with children developing anxiety related to aversive sensory experiences. Conversely, anxiety can trigger increased symptoms of sensory processing issues, such as intense sensitivity to tactile or auditory input in the presence of anxiety related to school attendance, test taking, social activities or other stressors. Understanding that anxiety may be influencing a child’s behavior is the first step toward finding resolution for a challenging behavior. Addressing anxiety is often the key to helping children feel secure and confident so they can successfully navigate participation in everyday activities. At STEPS for Kids we recognize how even a little anxiety can have a big impact. Providing the right support and a caring environment can make all the difference in reducing a child’s anxiety. There are many ways to help a child relax when feeling nervous. Here are some of our favorites that we recommend to parents. Our goal is always to help children learn the skills they need to reduce anxiety through improved task performance, increased self-awareness, and independence in self-advocacy. We help parents to understand their child’s perspective and to practice empathy for their child’s experiences and needs. By focusing on skills, we recognize that all children are capable of new learning that reduces or eliminate meltdowns. Teaching proactively is more effective than punishments for “bad behavior” that many parents use in an attempt to manage meltdowns. Keep in mind that children in the midst of a meltdown at the peak of the anxiety curve – no learning occurs due to the intensity of the emotional experience. Teaching when the child is calm is the most effective way to influence behaviors. To learn more about anxiety in children and for more ideas for calming, read this post or contact us today for more information. Does your child get worked up easily? Does she stay awake worrying about things that may or may not happen? Does he stress over everyday interactions? It can be difficult to see your child struggle in this way, but there are a wealth of resources available to help you help them cope. I love the website gozen.com for a great introduction to anxiety in children, and I always recommend it in my course. It’s a great resource for parents and professionals, an entire program to help with anxiety and OCD in kids. Here is a great post GoZen shared on Huffington Post. I really like this page at Coping Skills for Kids. There are so many good ideas for calming strategies! This site at The Chaos and the Clutter is very helpful – an anti-anxiety kit for kids, and they even explain how bet to use it. Click on “Youth” at this site from AnxietyBC for pages created just for your kids; I encourage you to review their pages directly with your child, too. If you’re looking for a more in-depth understanding of the anxiety your child is feeling, this article from Parents is very informative. If you’re concerned about your child’s anxiety, hopefully these resources will give you a few ideas and tools to begin to help them. For more custom input, get in touch with STEPS for Kids today.